Be the first to share your favorite memory, photo or story of Tally. This memorial page is dedicated for family, friends and future generations to celebrate the life of their loved one. We said goodbye to a brother and friend last week. On Monday, August 27, Tally Edward Miettinen was taken home to rest with his Lord and Savior. 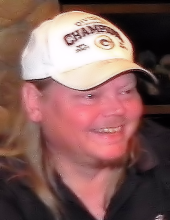 Tally (named after our parents dentist friend’s last name) was the youngest son of Brian Miettinen and Alice (Wanttaja) Miettinen, and was born in Kenosha, Wisconsin on March 22, 1959. He was a smiling, prankster of a child and liked to make people laugh, which didn’t change as he grew older. Once, he hid under our dining room table with a newly acquired tape recorder and recorded a heated discussion between our father and another relative. Moments later he stayed under the table and began to play back the recording. My parents were horrified at first and then everyone began to laugh, Tally the most! Tally, whose name often had him called Sally and would receive mail addressed to “Miss”, graduated from Baraga High School in Upper Michigan. He spent his working life after High School as a machinist, most recently working for Richmark Patterns Inc. in Greenville, WI. He also learned auto mechanics from our father, who could take a car apart and reassemble it with no problem. When younger, he used to help Brian “make pulp” each year in the U.P. Tally loved his dogs and all of nature. Shooting and hunting were also things he enjoyed. He would be the first one to help a neighbor in need, if he was able and always wanted to try and solve whatever problem was at hand. He was an avid Packer fan and very good golfer too! Even though he was limited in mobility during his last few years, he still got the most joy from knowing he helped someone in some way ~ Caused a smile, bought them a special treat (pizza or donuts), or lent a listening ear. Tally is survived by his brother Steven Miettinen (Negaunee, MI), sister Pamela (Miettinen) Madigan (Berthoud, CO), 2 aunts, 3 nieces and their families, and many many cousins. His remains will be laid to rest in Upper Michigan with our parents. If you feel moved to do so, please donate to your local animal shelter in Tally’s name. He found so much joy in his “doogies” as he put it. Tal, you will be missed. Heaven is smiling a bit more since you arrived. To plant a tree in memory of Tally Edward Miettinen, please visit our Tribute Store. "Email Address" would like to share the life celebration of Tally Edward Miettinen. Click on the "link" to go to share a favorite memory or leave a condolence message for the family.